I learned in this answer that touch screens with a glass front are generally more sensitive and accurate than those with plastic fronts. This corresponds with my personal experience. However, is there a way to bring devices with plastic fronts up to the accuracy and sensitivity levels of those of glass? What would this require? There are many ways of constructing a PCAP touchscreens and some of them are entirely independent of the glass material. In effect the touchscreen is a film attached to the coverglass (or plastic) so as long as the material does not mess with the electric field projected by the capacitive terminals the touchscreen is perfectly happy. 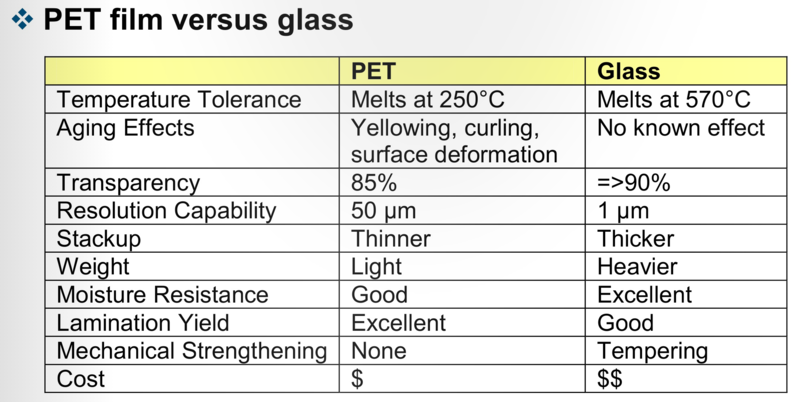 On the other hand glass has better permittivity than most plastics so you get roughly similar capacitance with 2-3x thicker glass than you would with plastic. Whether or not this is significant depends on the application. General trend is to create as thin coverglass as possible and thick glass solutions are reserved more to vandal-resistant public displays. Some touchscreens are actually integrated to the LCD display, which is what Apple does. Without going to gritty details, your touchscreen requires two terminals, between which the capacitance change is sensed. Depending on construction these may be separate films with insulating layer in-between, single layer constructions with some clever routing, exploiting LCD display cells as a terminal etc. Most basic of these are organized as a crisscross pattern with separate layers, more sophisticated use diamond patterns that etch jumper bridges to "hop" over opposing terminals and so on. In fact you don't need the glass at all for the touchscreen to function. Except touching the touch screen would "short" the traces. Your questions requires a bit more specification as to the technology behind the touch detection. Typically, plastic surfaces are resistive touch panels placed in-front of glass or plastic LCD screens. They have to be made from plastic (as opposed to glass) because they detect touch by deforming. The user's finger bends the plastic film where it touches and this presses an upper film into one beneath it completing a circuit (4-wire design) or enables a complex triangulation of the deformation location (5-wire design). This style of screen is used in many industrial applications because it works when you have gloves on (factories, hospitals, etc). Typically, glass touchscreens use a technique called capacitive touch detection. They emit a constant quasi-static electric field and look for changes to that field caused by the presence of conductive (charge storing) materials nearby (like your finger). Yes. You can make both. It is possible to make capacitive screens on plastic substrates. There are many applications that do, but it's not done on CellPhones (and virtually all consumer applications) because for the higher cost of the capacitive circuitry and the relatively minimal cost to go from plastic to glass, the outcome is much nicer for the finished product. You can make plastic capacitive touch screens as accurate as glass ones if you use the right substrates. Glass works well because it is optically clear and doesn't electrically polarize easily, this can hold true for certain plastics as well. This is, however, not true of the typical commercial plastic (PE, PET, PTFE, PVC, etc) -- you need additives or alternate chemistry. Plastic touch panels appear less sensitive because the ones you commonly encounter are a different type of technology (resistive touch panel -- RTP) that requires physically deforming a film, measuring the location of the deformation, and tracking one finger at a time. Glass panels appear more sensitive because capacitive sensing responds to the mere presence of your finger and does not even require that you touch the screen. Plastic screens have resistive touchscreens and glass screens are capacitive touchscreen devices. The difference is fundamental: the first checks the resistance which changes when you press the screen, and the second detects the presence of the capacitance of the finger. Resistive screens must be calibrated and then can be accurate but are usually cheaply made and need to be recalibrated from time to time. Not the answer you're looking for? Browse other questions tagged touchscreen materials plastic or ask your own question. How to make a touch screen device with android OS? Nitrile and touch screens. What is the distance required from your finger to the screen to make it work? What is the purpose of the IR-diode Cover on Remote Controls? Touch screen reacts exclusively skin and stylus, how? How does glass create an electric field?